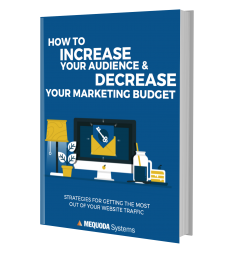 Download a FREE copy of How to Increase Your Audience and Decrease Your Marketing Budget and discover how to get the most out of your website traffic and turn visitors into digital dollars. If you’re a reader of Mequoda, you may have noticed we’re firm believers in the power of email newsletters as a marketing channel – so much so that a Mequoda subscription website is built specifically to give away content and harvest email addresses, rather than sell magazine subscriptions. This is a far cry from the old print days when you could rent or buy lists of addresses, and the one and only thing you had to do was sell subscriptions via carefully-crafted, elaborate direct marketing packages. But we haven’t forgotten our roots. Of course every publisher’s goal is to sell subscriptions, even if it’s not front and center on subscription websites. So how do you sell subscriptions then? That’s exactly what you’ll find out when you download How to Increase Your Audience and Decrease Your Marketing Budget today. Now is the time to learn from what some describe as the industry’s most comprehensive set of audience development strategies and leverage them to increase your revenues by 20% or more. When you read How to Increase Your Audience and Decrease Your Marketing Budget you’ll discover how to build an email list, and how to organize your email marketing efforts in a way readers enjoy and look forward to while still hitting your revenue goals. By the way, you’ll note that in exchange for this free handbook, we’re asking for your email address, and you’ll also be offered a subscription to our free email newsletter. If you read this FREE report, you’ll learn that’s another one of our secrets for successful audience development; I practice what I preach. If after you’re done reading, you’d like to talk more about how to put these principles into practice, let’s schedule a time to chat. I hope you enjoy the report and I look forward to talking more with you. PS: Our clients pay handsomely to gain access to the Mequoda consulting team’s expertise. But when you read How to Increase Your Audience and Decrease Your Marketing Budget, you get the outline of our proven methods all in one place, to read and reference any time you need it. Mequoda Systems empowers multiplatform publishers to grow their audience, revenue and profits by integrating their web, email and fulfillment systems into a seamless customer experience management system (CXMS). Our clients routinely double, or even triple, their profits in five years or less using our Mequoda Haven CXMS, the only customer experience management system created by publishers for publishers. We’ve worked with hundreds of clients helping them plan, develop, implement, and optimize successful multiplatform publishing businesses. That means we have the data, the benchmarks and the experience to help you transition – or launch – in the multiplatform publishing age. If you want to learn more about building a Mequoda System with Mequoda Haven CXMS, let’s schedule a time to chat. Amazing! This is so similar to book publishing. EXCELLENT READ. MOST VALUABLE. THANKS FOR SHARING.